. @BlairWalsh3 now has 20 FGs of 50+ yards. Tied for the most since 2012. Harris has played pretty well in this game all things considered. Rougher night for officiating than this #Vikings ' depleted defense.
.@Wallace17_daKid with the big catch for the 3rd down conversion! On 3rd and 9, the #Vikings pick up a big gain. Bridgewater hits Wallace for 23 yards to the #AZCardinals 24. Holding backs the #Vikings up to the #AZCardinals 34. Zach Line is the 11th #Vikings player to catch a pass tonight. 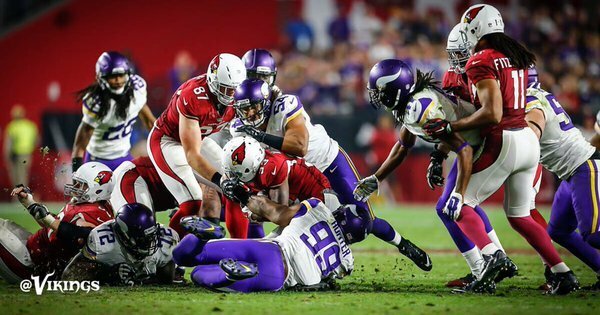 The #Vikings move the ball to the #AZCardinals 10.
.@ZLINE48 breaks tackles to give the #Vikings a 1st down at the ARI 10!
. 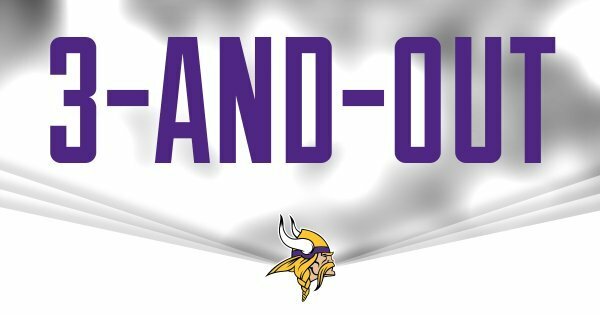 @ZLINE48 with a 24-yard reception to give the Vikings a 1st down on 1st-and-20. His 5th reception of the season. 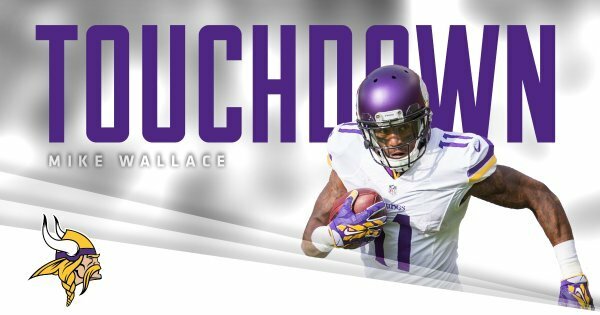 Teddy at 289 yards and Mike Wallace catches a touchdown. Got to love football. Bridgewater hits a wide open Wallace for a 7-yard touchdown. We are tied at 20 with 4:55 to play. 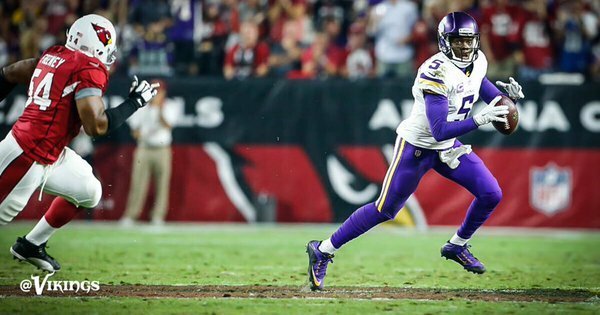 Maybe the best NFL drive Teddy Bridgewater has led. Very impressive comeback game from him, but enough time for Carson Palmer to win it.
.@BlairWalsh3 hits the XP and we're tied at 20!
. 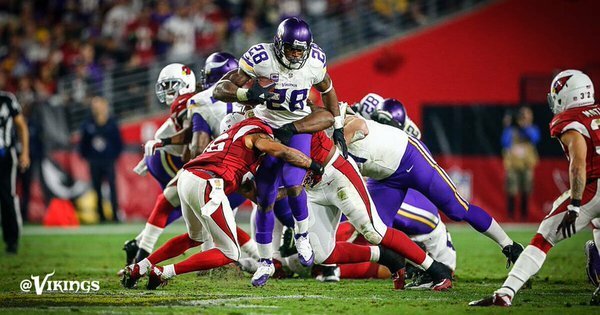 @Wallace17_daKid 2nd receiving TD as a Viking, the 49th TD of his career. 20-20 with 4:55 to play. Probably enough time for Cardinal and Teddy drive. Offense is back to life!! Mike Wallace: 1st offensive TD for Vikings by a player other than Adrian Peterson in their last 15 quarters. If Vikings win this game, amazing how much different we'll feel only four days after thinking the sky might be falling. Scott Crichton walking off after a scary moment there. Numerous players were down praying after the play. Palmer hits @MichaelMFloyd over the middle for a 22 yard gain to the #AZCardinals 49. Palmer hits...guard Mike Iupati for a first down. Ok...he caught it off a deflection. Still. Soft hands for the big man!
. @Crichton253 is being evaluated for a concussion. What a fluky play.. Robison deflects slant pass with helmet, Cardinals' guard Iupati catches popup for a first down.